cord characterize the evolution of vertebrate nervous systems. other bones developed into powerful jaws, which facilitated the predatory nature of these animals. gather information from the outside environment. 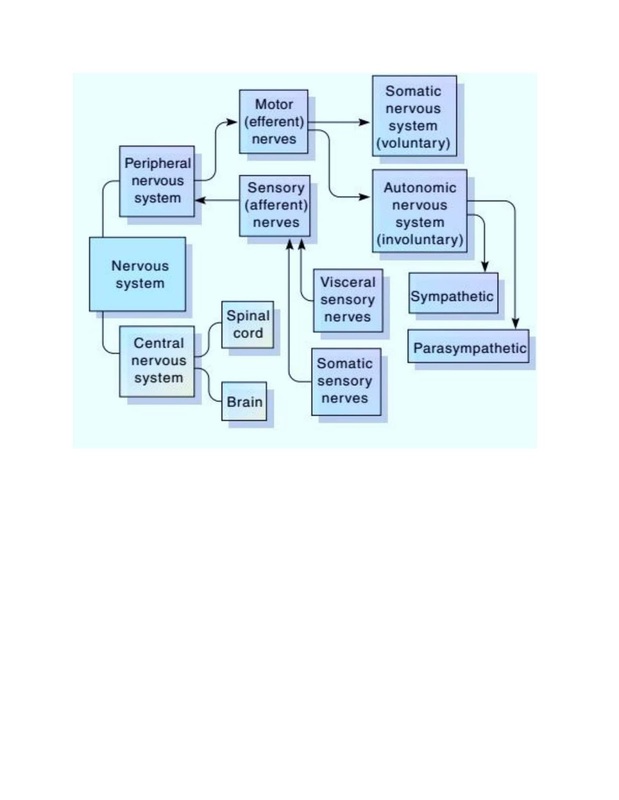 The nervous system of vertebrates has two main divisions (see figure). Sensory (afferent) nerves, transmit information to the central nervous system. (smooth and cardiac) and glands of the body. The nerves of the autonomic nervous system divide into sympathetic and parasympathetic systems. and ganglia if they are present of the peripheral nervous system. All cells have some stimuli that relay information both internally and externally. They have no real nervous system, such as in the protozoa and sponges, but they have the coordination and reaction to external and internal stimuli. For example, the regular beating of protozoan cilia (see figure) or the response of flagellates to varying light intensities requires intracellular coordination. Only animals that) have true nervous systems. This clearly excludes the protozoa and sponges. Some animals more complex than sponges, five general evolutionary level in nervous system id present. The first has been integrated throughout part two of this text. More complex animals possess more complex nervous systems. The cnidarians (hydras, jellyfishes, and sea anemones)that have the simplest form of nervous system. These animals have a nerve net, a framework that conducts impulses from one area to another (figure a). These nerve nets, have bidirectional impulse conduction by neuron. Cnidarians lack brains and but have local clusters of neurons. So, a nerve stimulus anywhere on the body initiates a nerve impulse that spreads across the nerve net to other body regions. In jellyfishes, this type of nervous system help to move slow swimming movements and in keeping the body right-side up. Echinoderms (e.g., sea stars, sea urchins, sea cucumbers) also have nerve nets, but they are complex. For example, sea stars have three distinct nerve nets. The First that lies just under the skin has a circumoral ring and five sets of nerve cords running out to the animal’s arms. Another net serves the muscles between the skin plates, that is the ossicles. The third net connects to the tube feet. Animals, such as flatworms and roundworms, that have sense organs concentrated in the body region that first meet in new environmental stimuli. Thus, the second level in nervous system evolution involves cephalization, which is a concentration of receptors and nervous tissue in the animal’s anterior end. For example, a flatworm’s nervous system contains ganglia, which are distinct aggregations of nerve cells in the head region. Ganglia function as a primitive “brain” (figure b). Distinct lateral nerve cords (collections of neurons) on either side of the body carry sensory information from the periphery to the head ganglia and carry motor impulses from the head ganglia back to muscles, allowing the animal to react to environmental stimuli. These lateral nerve cords reveal that flatworms also exhibit the third level in nervous system evolution: bilateral symmetry. Bilateral symmetry have paired neurons, muscles, sensory structures, and brain centers. That help coordinated movements, such as climbing, crawling, flying, or walking. 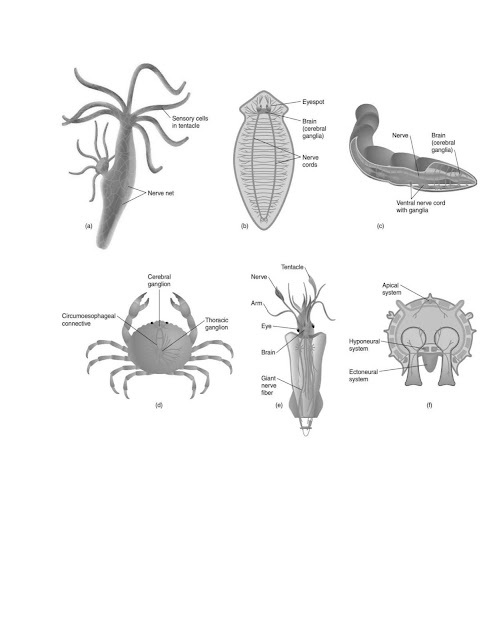 In some invertebrates, such as crustaceans, segmented worms, and arthropods, the organization of the nervous system shows further advances. The axon in these invertebrates, join into nerve cords, and the size of it small, centralized brain, smaller peripheral ganglia help coordinate outer regions of the animal’s body. Ganglia can occur in each body segment or can be scattered throughout the body close to the organs they regulate (figure. Regardless of the arrangement, these ganglia represent the fourth evolutionary level. The more complex an animal, the more interneurons it has. Because interneurons in ganglia do much of the integrating that takes place in nervous systems, the more interneurons, the more complex behavior patterns an animal can perform. In echinoderms, such as starfishes, the nervous system is divided into several parts (figure f ). The ectoneural system retains a primitive epidermal position and combines sensory and motor functions. A radial nerve extends down the lower surface of each arm. A deeper hyponeural system has a motor function, and the apical system may have some sensory functions. The fifth level in the evolution of invertebrate nervous systems is a consequence of the increasing number of interneurons. The brain consist of largest number of neurons, and have more complex the animal, and the more complicated its behavior, the more neurons are concentrated in an anterior brain and bilaterally organized ganglia. Vertebrate brains are an excellent example of this level. When action potential travels along an axon after it reaches the branching end of axon terminal called the end bulb. The synapse is the space between the axon of one neuron and the dendrite of another neuron or effector cell. The space (junction) between the end bulb and the dendrite of the next neuron is the synaptic cleft. 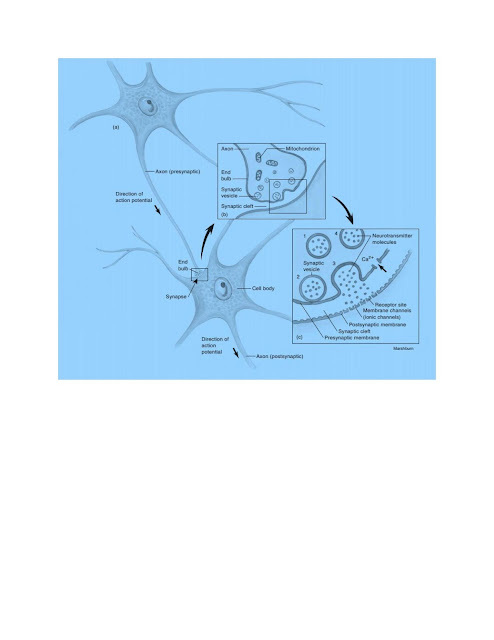 The neuron carrying the action potential toward a synapse is the presynaptic (“before the synapse”) neuron. It initiates a response in the segment of a postsynaptic (“after the synapse”) neuron leading away from the synapse. The presynaptic cell is a neuron, but the postsynaptic cell can be always neuron, gland cell or muscle cell. Synapses can be electrical or chemical. Electrical synapse, nerve impulses transmit nerve impulses, directly from neuron to neuron when positively charged ions move from one neuron to the next. These ions depolarize the postsynaptic membrane, as though the two neurons were electrically coupled. An electrical synapse can rapidly transmit impulses in both directions. Electrical synapses are common in fishes and that give the their ability to dart swiftly away from a threatening predator. In a chemical synapse, two cells communicate through the chemical agent called a neurotransmitter, that release from the presynaptic neuron. A neurotransmitter changes the resting potential in the plasma membrane of the receptive segment of the postsynaptic cell, creating an action potential in that cell, which continues the transmission of the impulse. result, the impulse continues its path to an eventual effector. Once acetylcholine has crossed the synaptic cleft, the enzyme acetylcholinesterase quickly inactivates it. Without this breakdown, acetylcholine would remain and would continually stimulate the postsynaptic cell, leading to a diseased state. You have probably created a similar diseased state at the synapses of the fleas on your dog or cat. The active ingredient in most flea sprays and powders is parathion. It prevents the breakdown of acetylcholine in the fleas, as well as pets and people. However, because fleas are so small, the low dose that immobilizes the fleas does not affect pets or humans. (1)Excitability, The ability to respond to stimuli; and (2) Conductivity, the ability to conduct a signal. 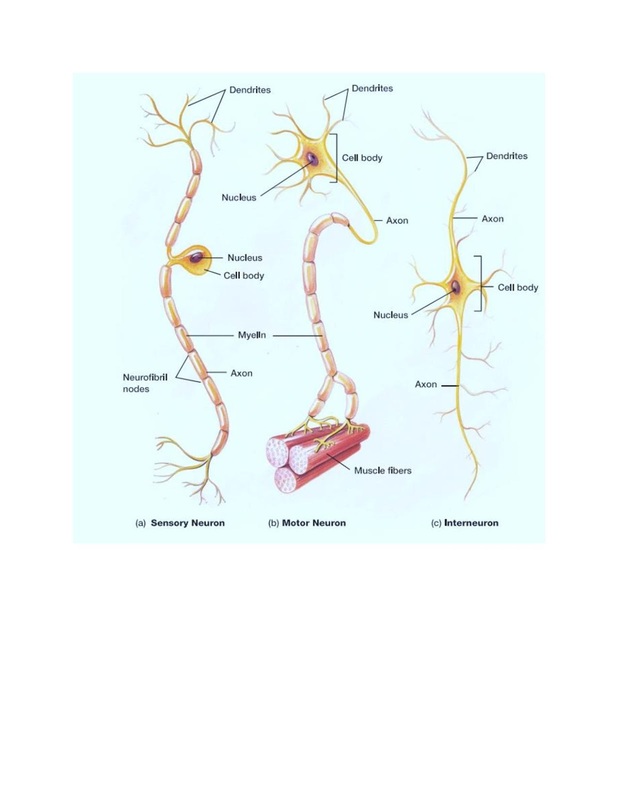 Sensory neurons either act as receptor of stimuli themselves or is activated by receptors (figure a). When the internal or external environments change then it stimulate sensory neurons, which are responsible to send the signals to the major integrating centers where information is processed. Interneurons (figure c) consist the integrating centers and receive signals from the sensory neurons and transmit them to motor neurons. Motor (effector or efferent) neurons (figure b) that send the processed information a signal to the body’s effectors (e.g., muscles),that cause to contract, or to glands, causing them to secrete. What is the communication and give their type? Neuron are those in which electrical signals transmited that give information or initiate a quick response in a specific tissue. Hormones are those which are slower than neuron,that is the chemical signals that initiate a widespread, prolonged response, often give the variety of tissues.